We speak to editor Amy Hetherington on why the concept behind the magazine The Big Issue is simple. Can you describe The Big Issue and its concept? Who is it for and what does it cover? The Big Issue is a lively, informative and often cheeky general-interest magazine with a social conscience, read by teenagers to centenarians and everyone in between. We cover a broad range of topics that tap into the zeitgeist and hopefully spark conversation. Already this year, we’ve interviewed Magda Szubanski, Ai Weiwei, Wes Anderson, Courtney Barnett and David Attenborough; we’ve looked at Australia’s literacy crisis and rising homelessness rates; we’ve celebrated the nation’s first Nobel Peace Prize winners; and we’ve laughed along with many of our country’s funniest comedians. Plus, we feature stories from our vendors in every issue. The Big Issue’s concept is simple: it helps the people who sell it – people doing it tough for all kinds of reasons, often reasons beyond their own control. How? Vendors earn half the cover price. They buy the magazine for $3.50 and sell it for $7 on the streets all around Australia. And subscriptions to the mag help to employ women in need. What is the best part about being the editor of The Big Issue? We are media that makes a difference – to the people who sell our mag, and through the stories we are able to tell every edition. It’s this purpose that makes my job so interesting and satisfying. Plus, I work with a great bunch of talented and creative people who really care about producing the best possible magazine for our vendors and readers. And I always love launching each new edition over breakfast with our vendors – it’s a great opportunity to catch up, check in and share stories. Can you set the record straight on some misconceptions people might have about The Big Issue? The Big Issue is not a political magazine. Or a religious magazine. It is simply a great read! It’s also fundamental for people to know that our vendors are working to make a living. They earn an income from every magazine sold, so it’s important to take the mag and support these enterprising people. How does a subscription to The Big Issue make a difference in women's lives? Each time you take out a Big Issue subscription for your office, waiting room or as gift to a friend (or to yourself! ), you are helping to employ and empower a woman who is facing disadvantage in some way. Most of our street vendors are men, because some women don’t feel safe selling the magazine on the street, especially those fleeing family violence or caring for kids. 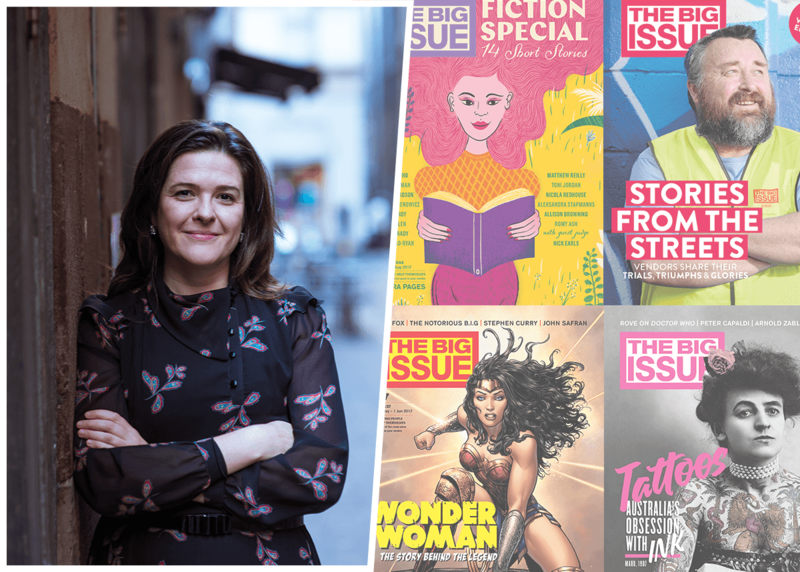 The Women’s Subscription Enterprise, run by The Big Issue, employs women to pack the mag for distribution to subscribers every fortnight, providing them safe and secure employment, as well as access to training, mentoring and support. What impact does The Big Issue have on the lives of people doing it tough? Selling The Big Issue and packing subscriptions gives our vendors and women’s enterprise employees purpose. Income is just one reason people sign up to sell and pack the magazine. It’s also about personal development and social inclusion. It helps to boost people’s self-esteem, helps develop new skills and helps them to feel engaged and involved with the broader community. What can readers expect from future issues of The Big Issue? We’re always working on the next big story… stories with heart, stories that will make you laugh and cry, stories that will stop you in your tracks, stories that will make you think, stories that will inspire you to make a difference. But I won’t give away any cover secrets just yet, I’d rather give you a surprise! The Big Issue does things differently. We publish real stories by real people. We give people on the margins a voice. We collaborate with some amazing writers, illustrators, columnists, cartoonists and photographers. We work with both established and emerging talent, as well as some big names. What is The Big Issue’s motto and what does it mean? Our motto is “helping people help themselves”. And The Big Issue does just that. We provide our vendors with the means to find their feet – and oftentimes a voice.